The President made these remarks addressing the debate on the Constitutional Council, at the Parliament, today (21). According to the 19th amendment, the Constitutional Council and the Independent Commissions were appointed and even though the 19th amendment clearly stated the responsibility, policy and guidance of those institutions, those principles have not been fulfilled yet, the President added. 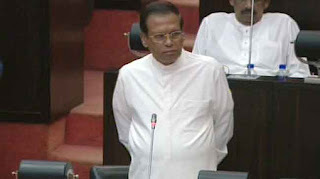 President Sirisena further said that he vehemently rejects the allegations levelled against him, erroneously interpreting a statement made by him recently in the Parliament regarding Independent Commissions. The President said that he has no objections against the judges appointed to the Supreme Court and the Court of Appeal and the issues raised by him were about the reasons for the rejections of the names of the judges presented by him to the Constitutional Council. If any name of a judge is rejected by the Constitutional Council, that judge has a right to know the reasons for the rejection, the President said that adding even a labourer has a right to question as to why his promotion was rejected. The President said that he made that interference to create a just and impartial system for the benefit of those rejected judges and for the judges who are waiting for promotions in the future and some section is trying to turn this upside down and to tarnish his image. If appointing Judges to the Supreme Court and the Court of Appeal is fair and transparent the President has the right to know about it and yet his nomination has been rejected and he is not made being aware of the reasons for the rejection, said the President. Although he received a report from the Constitutional Council once in 3 months, the reasons were not given in those reports, he said. The executive, legislature and the judiciary all three are being controlled by the Constitutional Council and that if a constitutional council is to take authority it cannot surpass the powers of the executive presidency, the President pointed out. The other legitimate children given birth by the 19th constitution are the Independent commissions said the President and if they are led towards the wrong path the expectations of the society which has kept faith on the Yahapalanaya will not be accomplished. The President pointed out that he is the only leader who has given up his powers after coming power in recent history and that he has done it with pure intentions towards establishing a pure and clean government. He said that whatever the decision of the Parliament regarding abolishing presidency he would agree with it as he has agreed earlier.